Hydrogen (H2)and oxygen (O2) react in a so called 'cold combustion' to water (H20) by providing energy. The overall efficiency is > 60%, while combustion engines operate at app. 35% (Carnot diagram). The energy that a fuel cell generates is available as electrical power and heat. Dependand of the actual load conditions of the split of electrical power and heat changes. The high efficiency, the direct generation of electrical power and the low to zero emissions make the fuel cell a superior technology. In a first step, moleculare hydrogen H2 is split in 2 hydrogen ions H+ and 2 electrons e- under catalytic influence (e.g. Platin). 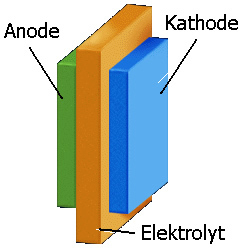 In a PEM fuel cell the electrolyte is conductive only for protons, therefore the positively charged H+ ions pass thru the membrane from the anode to the cathode. The negatively charged electrons have to travel thru the external load by providing electrical power. The reaction on the cathode is much more complex. In principle a oxygen molecule O2 from the surrounding air reacts with 2 H+ ions to H2O2 by consuming 2 electrons e-. In a second step H2O2 reacts to 2 H20 (water) molecules by consuming another 2 H+ ions and 2 electrons e-. At the cathode is a lack of electrons while on the anode we have a surplus on electrons. If anode and cathode are electrically connected, a electrons pass from the anode to the cathode to balance this difference in electrical charge. This current flows as long as the reaction is taking place or in other words as long as hydrogen and oxygen is available to the anode/cathode of the fuel cell. An electrical load connected to this circuit makes it possible to utilize the so generated electrical power. The theoretical open circuit of a fuel cell is 1.229 V, in real applications it is possible to achieve app. 1.05 V operating with pure oxygen and app. 0.95 V operating with air. To achieve higher voltage levels, which is often desired to drive standard loads, several single fuel cells are connected together in series to a fuel cell stack. The most commonly used fuel cell geometrie in the planar cell. 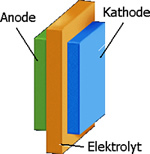 In a planar cell, anode, electrolyte (membrane) and cathode are put together in a sandwich structure. 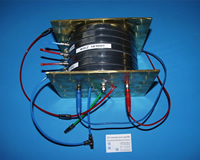 To achieve higher output voltages and higher power planar single cells are often combined to planar fuel cell stacks. In doing so multiple single cells are stacked togther and form a planar fuel cell stack. The planar fuel cell stack is electrically a serial connection of a certain number of single fuel cells. Therefore it is fairly easy to realize almost any output voltage requirement, since in a serial connection the single cell voltage just add up. For example, if you need a open circuit voltage of app. 17 V (translates to a nominal voltage of app. 12 V, since the MPP of a single cell is around 0.7 V), 17 single cells need to be connected in series to form a stack with the desired output voltage. In theory planar stacks could consist of hundredes of single cells, in real applications there are limits caused by thermal management (heat removal), gas flow (hydrogen and oxygen) and water management (PEM fuel cells). A second possibilty to combine multiple single planar cells is the so called stripe cell. Here the single cells are not piled together but rather combined in a single level. This geometrie is used when very flat geometries are needed (for example fuel cell to be integrated in laptop screen). 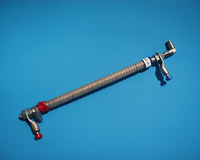 With the tubular cell the elements anode, electrolyte and cathode form a tube. The inner side of the tube is normally the anode layer (hydrogen side) then covered by the electrolyte layer followed by the cathode layer (oxygen side). Similar to the planar cells it is possible to connect multiple single tubular cells in series to form a array of tubular cells. Today tubular cells are utilized by the SOFC from Siemens Westinghouse. The coil cell is another interesting geometrie for fuel cells. In principle the coil cell is a long planar cell, which is then wraped together like a coil. The coil geometrie promises low cost volume production, easy replacement of defect single cells in a series connection, but has also some technical problems like electrical connections to solve. The idea and development of the coil cell started at H2-Interpower in Schwabach near Nuremberg, Germany. The various types of fuel cells are suited for different applications. The PEMFC offers low operating temperature and quick turn on times but require very clean hydrogen fuel since CO content does damage the noble catalysts. These features make the PEMFC a good fit for portable and mobile applications, while high power stationary systems are more suited for SOFC or MCFC. Fuel cell types like SOFC and MCFC are operated at much higher temperatures and therefore do not need noble metal catalysts. For this reason it is possible to use hydrogen rich fuel which may contain COx und NOx, which normally would damage the noble metal catalysts. Therefore these fuel cells can be fueled with natural gas or require only little external reforming. While the fuel cells operating at higher temperatures are less sensitive to COx und NOx, the turn on time and power on and off cycles are much off a problem. Each power on and off cycle may degrade and reduce the performance of such a cell, therefore they are best suited for a uninterrupted operation. Metal hydride have the ability to bind hydrogen molecules in their atomic structure under certain conditions. These conditions includes certain pressure level and temperature conditions. When filling up a metal hydride storage tank thermal energy generated and the tank needs ro be cooled to a certain temperature level. In reversal thermal energy is needed to release hydrogen from the metal hydride storage tank. In a lot of cases the hydrogen release rate at room temperature is sufficient, while in other cases external heat sources (for example the fuel cell itself) are needed. The process of charging and discharging a metal hydride storage tank is a reversible process. Metal hydride storage tanks can store up to 500x of the actual tank volume at pressure levels only slightly above atmospheric pressure. Storage of compressed hydrogen in steel tanks is a long known technology. Advanced technologies allow pressure level up to 70MPa (700 bar) and can store up to 700x of the tank volume. Currently research is done on new materials for the tanks to increase pressure levels and reduce weight. Liquid hydrogen LH2 is a the most compact way to store hydrogen. The energy to volume ratio of LH2 is app. 1/4 to that of gasoline. In addition LH2 allows to fill up the tank quickly. On the other side the storage tank for LH2 is quite complex, because it needs excellent thermal insulation (boiling point of hydrogen is at -252,77 °C). The generation of LH2 requires extra energy to convert the hydrogen gas into the liquid stage. Methanol is a pretty good alternative to hydrogen and can be used for DMFC's as well as other fuel cell types when a reformer is used. The use of methanol does reduce the storage problem significantly. The energy to volume ratio of methanol is 4,4kWh/l and is app. 1/2 that of gasoline. Methanol has a boiling point of about 65 °C and can be stored in tanks easily. For a better understanding of the the competitive technologies such as fuel cell, batteries (incl. metal-air-cells) and combustion engines the specific energy density of the utilized fuels are very important. 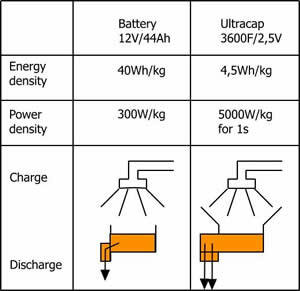 The following table provides key figures about energy to volume and energy to weight ratios of various fuels. When looking at these figures it becomes obvious, that beside the efficiency of the energy conversion technology, the fuel is a key factor to determine, which technology is suited for a targeted application. The DMFC converts liquid Methanol (CH3OH) into electrical power. The direct conversion of Methanol without external reformers makes the DMFC very unique, because a liquid fuel rather than gaseous hydrogen can be used. The structure of the DMFC is very similar to the PEMFC, only different catalysts are used to trigger certain chemical reactions. The following picture shows the electrochemical reactions that are taking place in a DMFC. On the anode, liquid Methanol is oxidized with water and Carbondioxide (CO2) is generated which is not needed and therefore removed from the fuel cell. As a result of this reaction free electrons e- and Hydrogen ions H+ are generated. 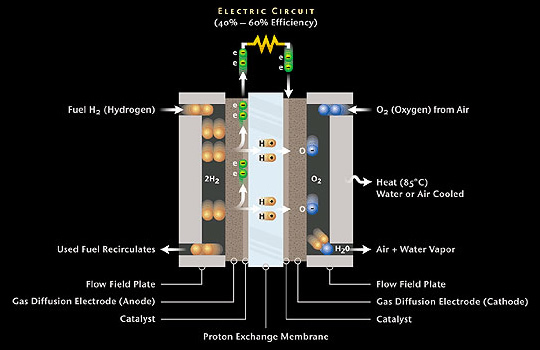 Similar to the PEM fuel cell, Hydrogen ions pass thru the PEM while the free electrons generate electrical power when passing thru the external electrical circuit. On the cathode, the Hydrogen ions H+, the free electrons e- and oxygen from the air react to water (H2O). The big advantage of the DMFC is the fact that liquid Methanol rather than gaseous Hydrogen can be used as a fuel. Since a liquid is much easier to store and handle than the gaseous hydrogen this is a significant advantage especially for mobile and portable applications. The disadvantages of the DMFC today are caused by some technical problems which need to be solved. First the so called crossover of Methanol thru the PEM is a major problems since it does reduce the cell voltage as well as removes part of the Methanol fuel from the anode side of the cell. Secondly, the currently achieved power densities of the DMFC are still significantly below the PEM fuel cell and other fuel cell types. This is mainly related to the relatively slow reaction speed of the electrochemical reaction described above. Therefore more research and development is needed to optimize these shortcomings. In summary the DMFC today is a very exciting technology especially for portable applications in the power range of mWs to a view kWs and has the potential to become a key technology for mobile applications when further breakthroughs in this technology can be achieved. Today the metal-air-cell technology suffers in several areas. The construction of a efficient cathode, which provides enough oxygen for the electrochemical reaction and the removal of Metal oxide from the electrolyte. Several companies are working on these problems and if successfull the Metal-Air-Cell technology could become very interesting for a lot of applications. Already today this technology is used for commercial battery products such as batteries for hearing aids and high capacity (at low current) batteries for certain applications. Future applications for Metal-Air-Cells include portable applications such as mobile phones as well as mobile applications such as electrical scooters and cars. Double Layer Capacitors (DLC, Supercaps, Ultracaps, etc.) are efficient energy storage devices, which can store and release electrical energy very quick. They are ideally suited for applications where short time backup power and peak power needs are critical. The Double Layer Capacitor is based on a discovery made be Helmholtz in 1856, who observed that a double layer is generated when a voltage is applied to electrodes in a electrically conducting liquid (electrolyte). 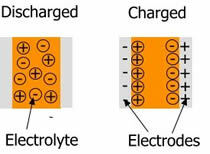 In discharged condition the positive and negative charged ions in the electrolyte are distributed equally, when a external voltage is applied the positive charged ions move to the negative electrode and vice versa. This is called the electrochemical double layer. The maximum voltage applied to the electrodes is limited by the dissociation voltage. Above this voltage level electrical loads can move to the direct attached ions on them and chemical reactions are started which cause the evolution of gases and therefore will destroy the capacitor. The use of an aqueos electrolyte limits the voltage to about 1V while electrolytes based on organic solvents allow dissociations voltages up to 2,5V. 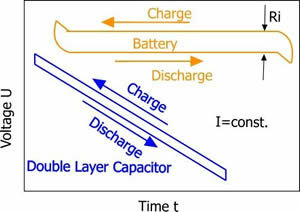 The high energy content of Double Layer Capacitor originates in the activated carbon electrode material, which has an extremely high specific surface area of about 2000m2/g and the extremely short distance between the opposite charges of the capacitor, which is in the order of a view nanometers (2-5nm). Since the dielectric is very thin, capacitances of a view thopusand Farad can be realized in a device as small as a soda can. Compared with accumulators Double Layer Capacitors offer a significantly lower internal resistance (Ri) and therefore very high discharge currents (power density). Also the charging of an Double Layer Capacitor can be done in seconds rather than in hours as with standard electrochemical accumulators. The energy density of a Double Layer Capacitor is significantly below that of accumulators. Todays Double Layer Capacitors allow up to 500.000 charge/discharge cycles and a lifetime of up to 20 years and are almost maintenance free. Ultracaps are used for two main types of applications today. One is to backup shorttime power outages or power interruptions (UPS etc.). The other application type is the coverage of peak power requirements where the Double Layer Capacitor has a huge advantage over accumulators . Wherever short power peaks need to be met Ultracaps are an ideal solution. As an example, today car manufacturers intend to use Ultracaps in conjunction with accumulators to provide more power for the starter generator especially at low temperatures.